An aging King, a govt increasingly at odds with its military and political infighting may spell trouble in Thailand. Saying that the truce is “increasingly fragile” is like saying Homer Simpson enjoys donuts or Barney Frank is a difficult interview: Thailand could easily blow up again, soon. After Yingluck’s election in July, the army, together with royalist elites (and presumably the palace) backed off slightly from the strident anti-Thaksin rhetoric and political fighting that had characterized 2009 to the middle of 2011. And in return, Yingluck apparently stayed out of the military’s way, allowing it to dominate its appointments and its budgeting. Her government also basically looked the other way as royalists upped the pace of lèse-majesté indictments against people for the slightest charges, including one elderly man who allegedly sent four text messages criticizing the king (though the court could not actually prove he’d sent the messages, or that he even knew how to send text messages at all). The military remained in prime position to stage a coup, if it wanted to, though senior officers insisted that is not in the cards — a promise made and broken many times before in Thailand’s history. 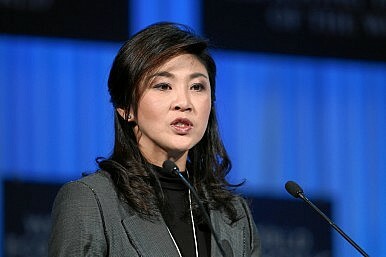 Yingluck’s government thus got little from this approach, which may be why Thaksin, and other power players, are now pushing her to move more aggressively — and now, while she still has the mandate from the July election, and before another potential upheaval if the king were to pass away. If, as prime minister, she can't exert virtually any civilian control of the military, they are arguing, what use is she? If she can't pass a new constitutional drafting assembly designed to remove the worst clauses of the constitution passed after the 2006 coup, then how will she ever help deflate the climate of impunity for the army and assuage many of her red shirt supporters, who are still furious over the bloodbath in Bangkok in spring 2010, as well as the hundreds of arrests and intimidation afterwards? As leading Red Shirt figures have been given more prominent positions in the government, they have become increasingly vocal, worrying the military and the Thai elite and middle classes. They also have learned, from the multiple street protests of the past five years, that if you don't get what you want, the best tactic now is to take to the streets and paralyze government and business. At the same time, the military, the Democrat Party, the Bangkok middle classes, and, presumably the palace, see that their window for pushing back against Yingluck, Thaksin, the red shirts, and their broader movement, is dwindling. Soon, a group of pro-Thaksin politicians who where banned from politics for five years will return — strengthening Yingluck’s party, giving it more policy substance, and potentially broadening its appeal to once again include some middle class liberals. The charter change could also provide an opportunity for Thaksin to come back, further inflaming the situation. Moves to establish more civilian control of the military, seemingly benign when viewed in the West, are seen by many hard-line officers as a mortal threat to their independence, political role, and access to sources of income. And, among the elite military, the Democrat Party, and certainly the palace, the fear of time running out is only exacerbated by the increasingly frail king, who looked his weakest yet in his birthday speech in December.